Yes, my youngest was sent home from school with lice. Don’t worry; I’ll wait while you say “eeewwwwww!!! !” and scratch your head like a crazy monkey. If you’ve never had to deal with lice – and I managed to go 47 years without it – it’s unexpected news that suddenly means a whole lot of unexpected work. The good news is that my daughter did not feel shamed or embarrassed at all, probably because the school had quite the outbreak, and she was far from the only one. When I was a kid, it was always hush-hush and embarrassing. You knew which kids had it because when they came back to school, their hair would always be shorter. Thank goodness that wasn’t necessary. My youngest is very, very vain about her very, very long hair. Also, being ashamed would be a waste of good energy, since the Center for Disease Control says that after the common cold, lice is the most commonly spread condition among elementary school children. But what, you may be asking, does this have to do with decluttering? Well, news of lice brings with it a lot of labor. In addition to the treatment of the hair, all the bedding must be washed and dried on hot. Pillows and stuffed animals that cannot be washed must be bagged, as lice cannot live for long off the body. Hair brushes, hair ties, clips and combs must be bathed in almost boiling hot water. All the floors, furniture, and beds must be vacuumed. Thanks to decluttering, my children don’t have a lot of extra stuffed animals, only the few they really love, so bagging them was not a chore. Thanks to decluttering, I knew exactly where the plastic bags and twist ties were stored, and I was able to easily access them. Thanks to decluttering, my furniture and my floors are no longer cover with papers, books, shoes, toys, art supplies, and laundry baskets, so vacuuming them was a straight-forward proposal. Thanks to decluttering, all the girls’ hair things are in one place and neatly organized, so cleaning them did not require a scavenger hunt first. And thanks to decluttering, my laundry room was tidy and free of piles of clothes, so I has room to drop the linens and a place to put them when they were dry. Cleaning the house to prevent a reinfection wasn’t a lot more difficult than just cleaning the house – all thanks to decluttering. Today’s declutter item: a Playhut pop-up train. The kids are way too big for it but have been very reluctant to let it go. It’s a perfect example of something left too long that may no longer be good, as the fabric has starting breaking down while its been stashed behind the sofa. Day 300 – Wow where did all that time go. I feel like I am dropping the ball at the moment but all I am really doing is trying to keep all my marbles together. Our precious boy was feeding himself today although I would like him to be eating a little more because there isn’t much of him in the first place. He can be a little cheeky at times but mostly he is very frustrated with his condition. I feel so helpless but unfortunately it is all up to him. 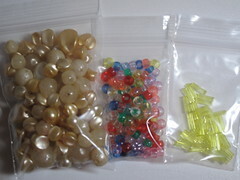 Some beads that are excess to my wants. Getting through one more day. My little girl cooking me dinner again. She makes a delicious blackened salmon sandwich with rosemary mayonnaise. An organised home which is a refuge from the storm of life that hit us so suddenly. Learning to be patient – wishful anxiety doesn’t make things happen faster. My husband – he is a tower of strength when the going gets tough. I won’t go into too much gross detail, but there is talk in the diabetic community and among folks with some of the other autoimmune disorders that hookworms are actually a benefit to the body, not a parasite. I’d roll around in the disgusting things if it would cure Clara, but in the meantime, no bugs on children! Thanks Jo. I think this is how Colleen is feeling about her neat and organized house right now too. It is great news about Liam, isn’t it? Colleen, that is simply great news that your son is able to be feeding himself so quickly – I hope things continue to progress at such an impressive pace. Colleen, I assure that no one here is judging you about “dropping the ball” on anything! As for myself, I am amazed that you are still going. My blog has been pretty dormant while dealing with some personal issues and a friend who was recently diagnosed with Devic’s disease. I applaud you for doing what you can! I hadn’t heard of Devic’s disease, so I looked it up. It sounds absolutely awful. I’m so sorry that your friend is experiencing it. It is wonderful news that Liam is feeding himself. One day at a time. Our prayers are still with you and your family, Colleen!!! I feel so helpless but unfortunately it is all up to him. That sums up a lot of being a parent, doesn’t it? Glad to read he’s feeding himself. What an amazing improvement over just 2 days ago! Hang in there, Colleen. Your attitude of gratitude, your faithfulness and steadfastness are an inspiration to all. Keep up the good fight and stay focused on what’s important in your life right now. Cindy is doing a fine job of providing us with interesting and informative material to read, so don’t worry about your blog. We won’t go away.